Specialized undergraduate degrees available from UA CAEM include an accelerated master's program, a Certificate to Master's Program in Transportation available exclusively to students at Soochow and Tongji universities, and a micro-campus initiative in Cambodia. Through CAEM’s Construction Engineering Management emphasis, students can focus on technical engineering and the business side of the construction industry. Technical electives in construction management, scheduling, and quantity take-off and cost estimating complement seminars on leadership, internships, construction site visits, guest speakers, clubs and competitions. For more information, see Construction Engineering Management (PDF). A cumulative GPA of 2.0 in these courses is required to fulfill the civil engineering minor. Use the academic advisement report (PDF) to keep track of your progress toward a minor. The civil engineering program provides graduates with the skills and knowledge to work on a variety of projects. Architectural engineering incorporates elements from fields such as systems engineering, electrical engineering and materials science. 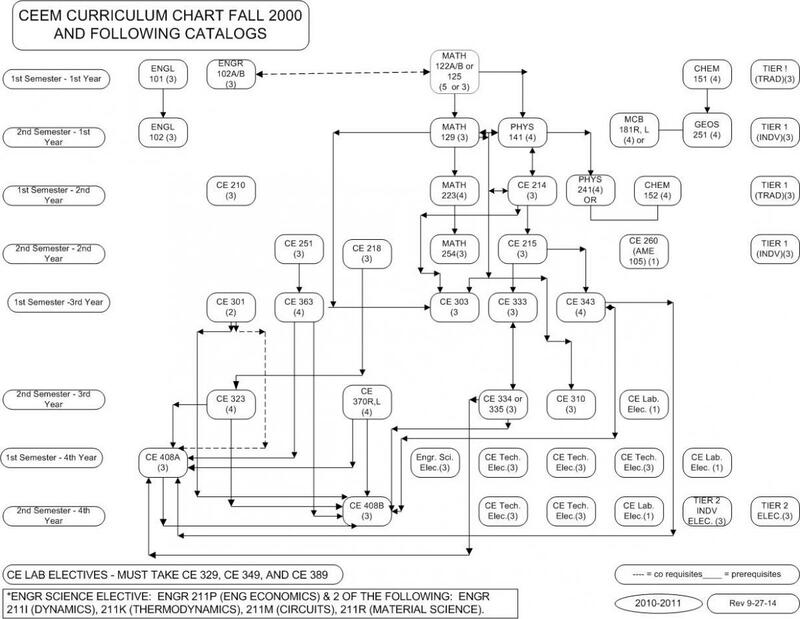 The College of Engineering’s four-year degree plans chart the advised sequence of courses for bachelor’s degrees in civil or architectural engineering. Visit CAEM Undergraduate Courses for a list of courses and associated syllabi. Additionally, schedules of courses for civil engineering and architectural engineering, through spring 2022, are available. In addition to core courses and prerequisites, the undergraduate civil engineering and architectural engineering programs require a minimum of five courses based in either design or analytics, with at least one elective in design. Students transferring into CAEM from community colleges, please see the College of Engineering’s transfer admissions page. Before taking 300- and 400-level classes, students must be granted advanced standing through the College of Engineering. Advanced standing in CAEM requires a minimum 2.25 cumulative GPA and completion of specific courses.The department lists CAEM advanced standing requirements here: advanced standing requirements (XCL). The Accelerated Master’s Program for Civil Engineering and Engineering Mechanics enables students to earn a Bachelor of Science degree and a Master of Science or Master of Engineering degree in as few as five years. See CAEM Graduate Degrees for more information. The University of Arizona in 2017 opened a location at American University of Phnom Pehn, a private, nonprofit university in Cambodia. Civil engineering was among the first programs offered at this micro-campus. Students in the Bachelor of Science in Civil Engineering program study at either campus, are co-taught by UA and AUPP instructors, and earn degrees from both institutions. The UA Certificate to Master’s Program allows students to obtain a Master of Engineering degree from the University of Arizona. Students at Tongji University or Soochow University in China apply to the program during the third year of their undergraduate studies, begin taking online UA courses during their fourth year, and come to the UA’s Tucson campus during their fifth year to take remaining courses.